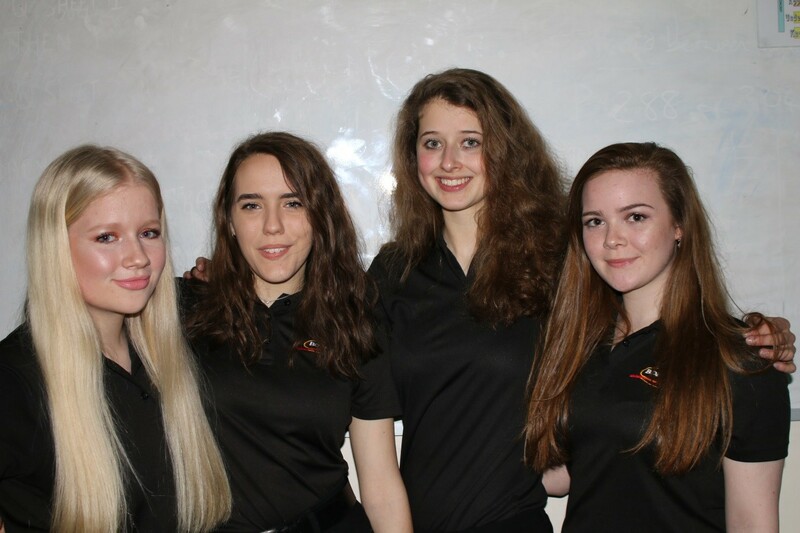 In December 2015 our all-female school Vex robotics team was formed. The students had two short months to code and build a robot for the “Nothing but Net” event. They worked extremely hard and completed the robot in time to compete in the Regional Championships. On that occasion they did extremely well to come second although they were disappointed that they did not qualify for the Vex National championships. They came back to school more determined than ever to succeed with the next Vex competition “Starstruck”. From that point the students honed their skills by building and coding a robot that addressed the requirements of this new competition. After only 14 months together as a team and with only one prior competition, in February this year they qualified for the National Vex championships. At the National championships they had to compete in alliances. Each match was played with an alliance of two teams against another two teams. The alliances changed for each match which made it challenging to adapt to different team strengths and weaknesses. The matches were played on a competition court that resembled a small tennis court with a low barrier across the middle. They all had the same format, 30 seconds with the robots in autonomous mode attempting to throw rubber stars and one large cushion cube onto the other alliances side of the court. The students then took control of the robots and had to drive them around the court area once again throwing the stars and large cushion cubes over into the other alliances area. Points were awarded depending on the position of the stars and cushions in the opposing alliances area at the end of play. The competition was held over two days with each team playing 15 highly competitive qualifying matches which then continued into quarter finals through to the grand finale. At the end of the championships our team had the position of 28th in the country out of over 180 original entrants. This is an amazing achievement in just over 14 months. The girls learned a lot about working in this type of environment and the engineering/coding requirements needed in order to compete at the highest level. In addition to the tournament there was also a skills challenge for the drivers. They had the court to themselves and had to see how much they could score in one minute. The girls finished 8th overall due to their driving skills. The new competition spec is available at the end of April and we look forward to taking up the challenge. Let’s see how far our team can go next year!! !